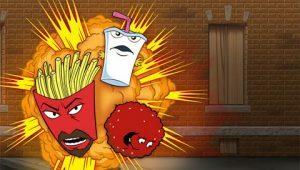 From the odd press release, it seems that the Master Shake, Meatwad, and Frylock will be known as “Aqua Patrol Unit Squad 1” instead of their previous title. The characters are upset with the direction of the show and want their 8th season…..erm…..1st season to get back to its roots. Whatever that means. We can expect for sure a new theme song by Queen of the Stone Ages’ Alain Johannes and other stuff. Whose to say this is a publicity stunt or this is for good. Whatever the new show is, I will definitely tune in to watch. The new season will air May 8th. This entry was posted on Wednesday, April 27th, 2011 at 3:19 pm	and is filed under Film, News. You can follow any responses to this entry through the RSS 2.0 feed. You can skip to the end and leave a response. Pinging is currently not allowed. « A New Zorro Film Is Coming To A Future Post Apocalyptic World Near You!! !